Rethinking Orthodox Clinical Medicine , Retraining Conventional Medical Graduates ; Protecting The Public. All Medical Graduates wishing to obtain MLC Licensing , must email us True Copies of their Medical Degree and Passport. All MLC Licenses and TeleHealth Permits are Subject to Fees, CME, CPD, FTP and Revalidation. The Medical Licensing Council is based on the MLC Model which was initially designed by Professor Doctor Joseph Chikelue Obi ; and is now being copied by various Medical Regulators All Around the World. At the Time when he (initially) designed it , Doctor Obi was ruthlessly harassed by the General Medical Council and it's Associated Allies of Regulatory Institutional Racism (Worldwide). Today , Almost All International Medical Regulatory Authorities have quietly copied the MLC Model without his Permission. Professor Obi has therefore (Formally) Leased the Intellectual Property Rights , of the MLC Method and Model , (Exclusively) to the Government of Biafra. The Special MLC License is a Full Medical License ; which is Statutorily Regulated by the Government of Biafra. It can either be Applied for Permanently (as per 50 Years) ; or on a Temporary (Pay As You Go) Basis , for a Minimum Period of 30 Days. Every Government has the Right to Issue It's Own Medical Licenses ; and the Government of Biafra will not be Lectured by any Foreign Entity as to How to Independently Conduct it's Affairs. To This Effect , We Will Not Tolerate Any Form of External Aggression from Any Quarters Whatsoever ; most especially from Certain (Highly Developed) Countries which are Currently Selling their National Passports (and National Honours) to the Highest Financial Bidders. As far as the Government of Biafra is concerned ; we are Fully Prepared to Issue a Full Medical License to Any (Approved) Medical School Graduate who Ultimately Meets our Stringent Criteria. 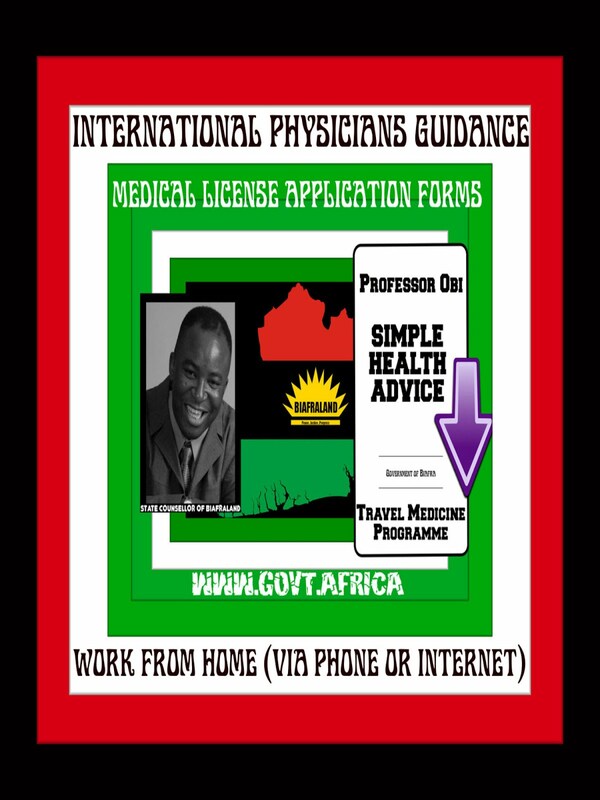 The Government of Biafra is also Working Directly with International Travel Corporations , Online (Internet) Pharmacies , Offshore Medical Schools and Other Secessionist (or Separatist) Nations (around the World) to Directly (and Cost-Effectively) Supply Qualified International Medical Graduates for (Suitable) International Medical Roles. 7 Key Examples of those who may benefit from MLC Licensing (with the Special MLC License). * Qualified Medical School Graduates who wish to Temporarily Register as Fully Licensed Medical Doctors (and TeleHealth Consultants) with the International Health Service of the Government of Biafra ; for a Minimum Period of 30 Consecutive Days per Year. * Qualified Medical School Graduates who wish to Temporarily Issue Online Prescriptions via Accredited Pharmacies of the Government of Biafra ; for a Minimum Period of 30 Consecutive Days per Year. * Qualified Medical School Graduates who Temporarily wish to Work as an Marine Physicians on Cruise Ships in International Waters; for a Minimum Period of 30 Consecutive Days per Year. * Qualified Medical School Graduates who Temporarily wish to Work as Aeromedical Physicians in International Airspace ; for a Minimum Period of 30 Consecutive Days per Year. * Qualified Medical School Graduates who wish to Temporarily Issue Perform Minor Surgeries via Accredited Medical Centres of the Government of Biafra ;for a Minimum Period of 30 Consecutive Days per Year. * Qualified Medical School Graduates who Temporarily wish to Work as an War Zone Physicians in Battleground Areas ; for a Minimum Period of 30 Consecutive Days per Year. * Qualified Medical School Graduates who Temporarily wish to Work as Charitable Physicians in Areas of Conflict and Disaster ; for a Minimum Period of 30 Consecutive Days per Year. I sincerely hope that this Exceedingly Blunt Statement fundamentally clarifies this issue. Basic Licensure Cost Basic Licensure : Less than 50 Pence (50p) Per Month ( Payable as a one-off Fee for the whole 50 Year Tenure). Basic MLC Licensure is Totally Different from the Special MLC License for Qualified Medical Doctors. One Year of Basic General Medical Council Licensure (and Registration) costs more than the whole 50 Year Basic MLC Offering. Certificate of Good Standing A 50 Year Certificate is Automatically Issued to each Licentiate upon Formal MLC Certification The GMC has Full Control of it's Registrant's Certificate of Good Standing ; and usually refuses to issue it directly to them. Damage (Crisis) Control , When Things Go Wrong The Medical Licensing Council (MLC) , previously known as the Medical Licentiates Consortium (MLC) and the Medical Licensing Commission (MLC) always helps it's Licentiates to get back on their feet again - and Fly . . . The General Medical Council almost always seems to publicly rejoice whenever Precious Medical Careers sadly seem to be Helplessly Sinking down the drain . . . Exclusive Professional Prefix for Registrants Medical Licentiates (MLC Consultants) can either apply for their very own unique MLC Prefix Title - or lawfully use their original Doctor Title if they so wish , provided that they do not describe themselves as being a General Medical Council (GMC) Registered Medical Practitioner None. The GMC does not hold any Exclusive Statutory Rights to the title of Doctor. 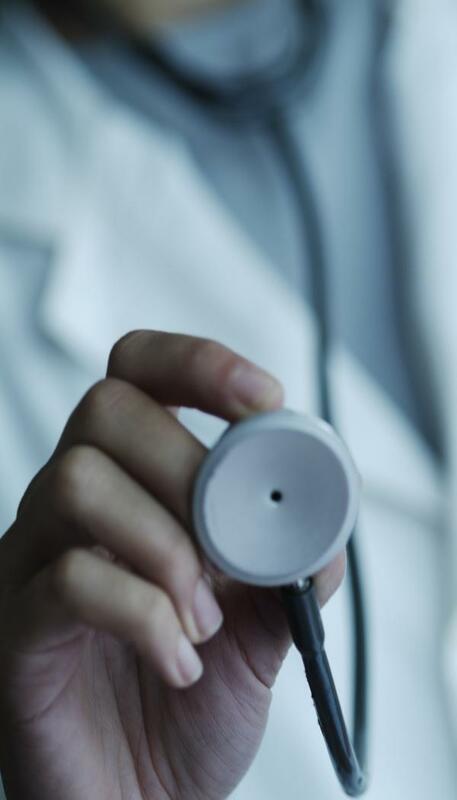 Private Clinic Opportunities Medical Licentiates (MLC Consultants) can swiftly set up their very own Private Clinics immediately their MLC License , Professional Indemnity Insurance and Immigration Formalities (if necessary) are in place. The General Medical Council Establishment often prevents it's Registrants from running their very own Private Clinics ; especially those who are relatively young in the Medical Profession. MLC Step 1 : Pay Fee , Contact Us , Send Documentation , Carefully study our Wellness Publications and Ethically Sit for the MLC Entrance Examination . MLC Step 2 : Legally Obtain Statutory Professional Liability Cover (Indemnity) from one of our Recommended Insurers. MLC Step 3 : Lawfully Launch your very own Private Specialist Clinic without any massive financial overheads ; while we continue to provide you with Permanent Regulatory Mentorship. The Medical Licensing Council is a Fully Accredited Regulator of the Government of Biafra and It's Associated International Clinical Allies.
. . . Every Available (Art-Based or Science-Based or Religious or Hybrid) Approach to either Medicine , Therapy , Research , Care , Regulation , Faith , Spirituality , Learning , Health , Healing , Wellness , Prevention , Detection , Promotion and Wellbeing etc , (whether Holistic or Focused or Standalone or Supportive or Native or Traditional or Otherwise) , which does not Decisively (or Solidly) Fall within the Any of the Fundamental Professional Realms of either Conventional (Orthodox Clinical) Medicine or Conventional (Orthodox Clinical) Advice or Conventional (Orthodox Clinical) Treatment or Conventional (Orthodox Clinical) Health or Conventional (Orthodox Clinical) Care or Conventional (Orthodox Clinical) Detection or Conventional (Orthodox Clinical) Diagnosis or Conventional (Orthodox Clinical) Prevention or Conventional (Orthodox Clinical) Promotion or Conventional (Orthodox Clinical) Therapy or Conventional (Orthodox Clinical) Research or Conventional (Orthodox Clinical) Regulation or Conventional (Orthodox Clinical) Evidence or Conventional (Orthodox Clinical) Learning (et cetera , et cetera , et cetera) . . . This is to categorically reiterate that the Medical Licensing Council (MLC) is an International Statutory Medical Regulatory Body which is Fully Accredited by the Government of Biafra. The Medical Licensing Council (MLC) has absolutely nothing (whatsoever) to do with the General Medical Council (GMC) of the United Kingdom. Please kindly visit www.MedLC.org for further information.